​The Knights of Columbus Council 6165 is dedicated to the promotion of Roman Catholic life, the support of our priests and seminarians, fraternity with our brother knights throughout the world, and service to our parish and community. Here you can find information on our council programs and activities, upcoming events, contact information, and links to our parish website and other Knights of Columbus sites. Thanks to all those who supported the Knights of Columbus Council 6165 fish fries this year through your labor and your purchases. Your purchases make it possible for us to support charities such as Immaculate Conception School, Khourey League, Immaculate Conception Youth, Gibault Catholic High School, our high school scholarship program, The Monroe Council for the Handicapped, Mind's Eye radio for the blind, St. Meinrad Seminary, and Seminarians in the Belleville Diocese. The Immaculate Conception Parish Chalice for Vocations Program is part of a parish-wide effort to pray for and promote vocations to the priesthood, the diaconate, and consecrated life. Contact Joanne Schilling at 618-281-5582 or at jrs530@htc.net to volunteer to bring home the consecrated chalice, along with a prayer guide, and pray for an increase in vocations and for those who have already chosen a consecrated life. Mike Sweeney was a five-time American League All-Star first baseman who served as the captain of the Kansas City Royals. The Sporting News voted Sweeny the "Good Guy in Sports" in both 2003 and 2004. Sweeney is a committed man of faith and a Knight of Columbus. He shares his powerful testimony of faith, character and the true meaning of fatherhood. ​Events- Here you can find information on upcoming events in which our Council participates or sponsors. Our home is at Immaculate Conception Parish in Columbia, IL; our council enjoys a very active, visible presence in parish life. ​Building the Domestic Church- Here you can find information and suggestions on how to cultivate a culture of faith in your family and household. We offer reflections and activities based on the Knights of Columbus program The Family Fully Alive: Building the Domestic Church. About Us- More information about our council and our leadership, complete with email links, can be found here. 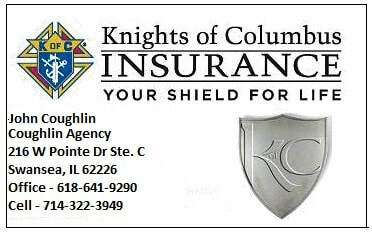 Contact- Email the Grand Knight and find links to other resources, such as the Knights of Columbus Supreme and Illinois Councils, insurance agent, Knights of Columbus gear, and parish and diocesan websites. Photo Gallery- See images of our Knights at work. Newsletters- Get the latest on what's happening in our community, in our council, and in our parish. Newsletters back to 2014 are available to download. 2018 KC Car Show- Get the details on the Second Annual Knights of Columbus Car Show sponsored by Council 6165. Find links to our Facebook page and photo albums from the 2017 show. Click here to ask questions, get more information, or to sponsor our show. How to Pray the Rosary- Praying this important devotional and meditating on the mysteries can help build your spiritual life, strengthen your faith, and help open your heart to hear God's call. This Knights of Columbus site will get you started and give you a guide to keep you praying the Rosary regularly.